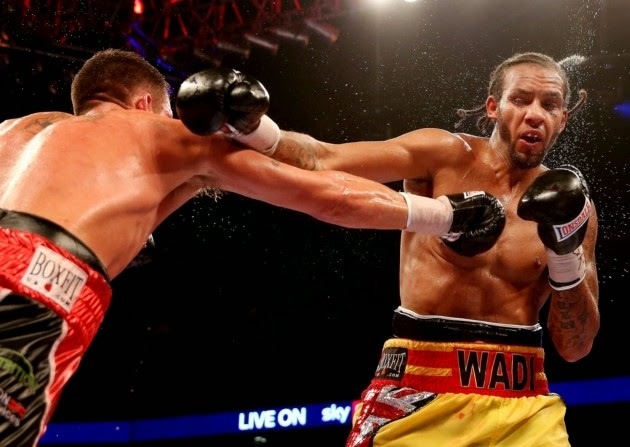 Welshman Craig Kennedy and Spaniard Wadi Camacho went head to head for the second time since a so called bite from Camacho toKennedy in October 2014. In Round 1, Camacho started well but took punches that were hard coming from Kennedy whocwas wearing Black trunks and Camacho wearing Yellow and Red Trunks. Camacho and Kennedy both took the ropes after they got stunned, that was round 1 over. In Round 4, Camacho had a good start and Kennedy was once again pinned to the ropes, The Macho Man carries on after a shot to his chin and right hands are thrown. Tags to the face of Camacho shook him, he still walked into punches and carried on and Kennedy pushed Wadi into the ropes. End of the round. In Round 5, Both competitors took caution and Kennedy slipped as he turned. Camacho charges into Kennedy and the Welshman is pummeled into the ropes. Both fighters threw flurries of punches with Camacho getting the best out of it and Camacho gets clipped by Kennedy. Camacho's left hand hs been brutal, but once again Camacho was on the ropes. End of Round 5. In Round 6, Kennedy was catching cleanly to Camacho, Kennedy was having an easy job in this round as far, but Camacho cleanly strikes a left hook. Camacho had a cut underneath his left and right eye and under his nose, he is going forward for the win. Camacho is getting stunned a lot. Round 6 came to an end. Round 7 starts and Kennedy connects more punches and the Spaniard is getting slowed down now, Camacho on the ropes. Camacho responded well to Kennedy and Wadi goes forward and gets stunned from a peach of a punch from Kennedy, Camacho got the count of 8, he got back up and Kennedy ends the fight, the Welshman wins the fight by Knockout after a five punch combination. No Biting to win the fight, it was just a clean TKO win for Craig "The Kid" Kennedy versus Wadi "Macho Man" Camacho. Kennedy finishes Camacho in the rematch of their Cruiserweight bout in Newport.